Salt and pepper two large lamb shanks then brown them on all sides in a large dutch oven. Remove the lamb shanks and add one and half cups of chicken stock and one and half cups of red wine and deglaze the pan. Bring to a boil. Remove from the heat and add the roasted ratatouille and put the lamb shanks on top. Put in the oven at 325 for 2 to 4 hours until the meat is falling off the bone. Remove from the oven. Remove the lamb shanks and cook over high heat to reduce the liquid by half for a wonderful sauce. 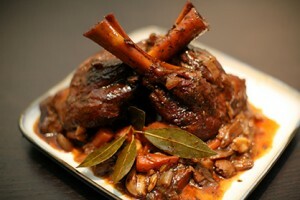 This is a simple, yet richly flavorful and succulent recipe for braised lamb shanks. Enjoy!